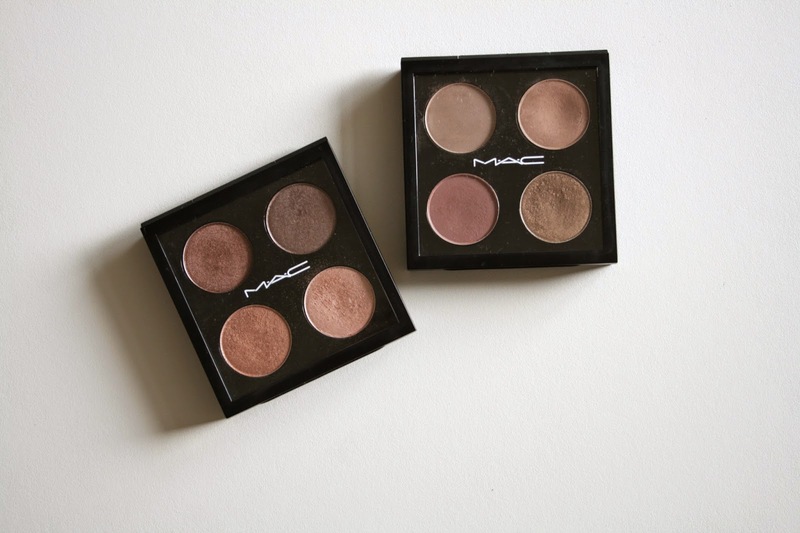 After more than a year of blogging, I thought I was due a MAC palette tour of my own. Now, this tour shall consist of two quads, filled with my favorite MAC eyeshadows (€10). Ready? Set? Go! The quad on the left has the 'shimmery' shades: Sable, Satin Taupe, All That Glitters and Naked Lunch. These got me covered for every occasion (I'm a neutral gal at heart). Sable (Frost): a plummy brown with bronze pearl, which creates a unique smokey eye. Satin Taupe (Frost): a taupe - surprise, surprise with a slight shimmer. However, it is a wearable taupe and I use it when I want something a bit more 'daring' than Sable. All That Glitters (Veluxe Pearl): a champagne with gold pearl. It warms up your eyes and makes them look bigger. It also makes for a v. good inner corner highlight. Naked Lunch (Frost): a minimal pink with shimmer. A wash of this wakes up your eyes - perfect for 'early mornings', if you know what I'm saying. It is also a great highlight. The other quad has mainly mattes: Omega, Wedge, Haux and Patina. The mattes are great on their own or as blending colors. However, Patina makes it perfect if I can only take one quad with me. Omega (Matte): a very soft beige-taupe. Its cool tones not only make it great as a brow color, but it also makes the perfect subtle blending color for most shadows. Wedge (Matte): a warmer version of Omega and more on the browner side. This is a lot like the shade 'Naked' from the Naked Palette. I use this as a wash all over the lid or as a blending shade. Haux (Satin): a smokey rose-brown shade. This is a great blending shade, the color seeming to adapt itself to the shade you match it with. Patina (Frost): my all-time favorite eyeshadow. It is a mix of bronze, taupe and brown, resembling the Maybelline Color Tattoo in On And On Bronze. What are some of your favorite MAC shadows? I'm always up for another quad *wink, wink*.